I'm 99.99% sure you mean 7,8,9 or 10 bit. Regarding the Serial Decode option. Does the Rigol DS2000A support 9-bit serial data? Actually its up to 16bit for data (the 9bit thing is a specific mode). So if Wuerstchenhund reads this, he is going to be a happy man! Why? Because some upper mid-range and high-end scopes support that (FYI: the cheapest scope that supports that option, the WaveSurfer 10, starts at $10k)? Brexit n - The undefined being negotiated by the unprepared in order to get the unspecified for the uninformed. There is another freshly released version for the SDS2000 series also fixing and enabling the PA option. when will it be available to purchase in US? AFAICT immediately but I have no pricing at this time. The PA option comes pre-installed and just an option code need be purchased to activate it. This new FW only enables the PA option to been seen now in the Options UI. Contact supplier for pricing and, pay and you will receive a code to enter online along with scope SN# and scope ID# to get the option activation code to enter in your scope. There is a new hidden Siglent webpage for pre-purchased option enablement. The link should be provided after purchase. I have it somewhere.........not found quickly. It has been changed to this method rather than sending the supplier the scope info in an effort to reduce/eliminate error. Excuse the ke_board errors. Fixed. is there an updated manual with the PA too? I recall rf-loop writing that you'd need special probes inserted (or at least a current probe) to activate the function.. what if i have my current sense amplifier and i wanted to use only voltage probes instead? Not that I can see online or in my records. In some short while we would expect new units shipped to have the PA option available for use in the Options trial time period. EDIT Upon updating with latest 2.2 FW 30 Trial times for use of PA option are activated. So all current 2000X series owners can have free 30 test drives with the PA option. I have it enabled in my SDS2304X (special test mode ) so I'll grab some screenshots of the UI. PA is accessed in the Utilities menu, P2. Each selection from the Analysis type menu creates different lists and types of analysis options to perform. Not to activate it but for the comprehensive suite of measurements to provide accurate data. One of the adjustments that must be made prior to using it is nulling the propagation delays between the voltage and current probes. (Deskew probes) Current probes need be an accurate and characterised for the PA analysis suite to give quality data. 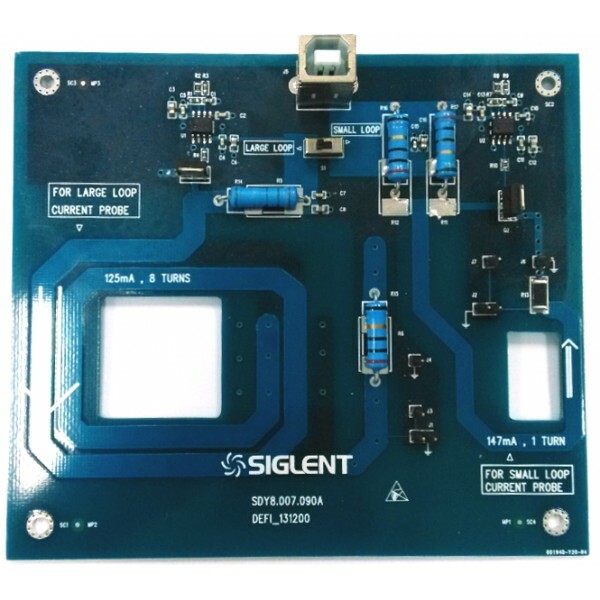 Siglent offer this accessory for accurate calibration and deskew of current probes. Connection is available on the PCB for the voltage probe to get the same pulse as through the current loop to allow nulling of the propagation delay with the Deskew adjustment provided in the 2000X. New firmware for SDS2000X models. 1. Optimized the self-calibration for better offset accuracy. Note: Self-calibration must be executed after upgrading to this version. Please be sure the scope has been working continuously for at least 30 minutes before performing the self-calibration. a) Intermittent inaccuracies in measurements collected during Roll mode. Thanks for the heads up. Updated mine 2104X, letting it warm up before self cal. This scope is quite interesting. - 140Mpts memory and 140k waveforms/s. However, 2k bucks is still a huge investment and a "toy" is not worth getting at that price. From what I see, the first firmwares in the SDS2000 (not X) used to be pure crap. But that's already from a long time ago. I see that the latest firmware for this SDS2000X was released on November 21st 2017, which is fairly recent. Can someone provide a clear summary of the good's and bad's of this firmware (or a very recent one) on the SDS2000X? Is the scope usable and reliable? If not, are there any reliable alternatives with the functionalities above? When Performa01 joins the thread at reply #41 he dives deeply into the UI and runs many tests and shows examples of things that were lacking but have now been improved. This UI has been further developed in 1000X and especially the new X-E models but essentially they operate in exactly the same manner. Of the Siglent range at this time the 2000X series is the flagship model that offers the most functionality. I have had zero problems with the 2000X units I've sold and the 2304 and 2304X models I have owned for personal and demo usage. There are few members here that have these 2000X models that might take the time to share their experiences with you. GW Instek MSO2204EA. Lower samplerate (but still enough for 200MHz) and less memory but OTOH longer FFT, input filtering, dual channel function generator, free math equations and a faster hardware platform. Thanks to both of you for your replies. nctnico, the MSO2204EA also seems like a good alternative! However, I cannot find this specific model anywhere in Europe (only one seller in the USA). Where have you found this? The closest I could find is the MSO-2204E (without the 'A') at Distrelec, 2150Eur TVAC (but it does not contain the arbitrary waveform generators). You can try Eleshop.nl. The MOS-2204EA is not on their website but they can order it for you. A while ago I got a quotation from them for this model when I asked for it. You might want to do some more homework on these as it appears the Decoding isn't yet fully functional. Decoding works just fine on the GW Instek scopes (and all of the memory is decoded!) but it needs to be adjusted to allow for lower oversampling rates. But you already knew that. New firmware for SDS2000X scopes. tested the functionality of the scome in more details yet. But after update and I started the calibration routine. The duration of calibration last longer then 3h!. Could someone confirm such observation. since getting the scope) the duration was less then ten minutes. Stock standard factory SDS2304X = 3 minutes, 10s. I had reflashed the fw back to the previous version. Flashing again the new fw and run calibration again. appears for every channel up to the end of calibration. after first fw update tow days ago. Now all seams to work properly. Thanks for the effort in testing. Is the scope supposed to remember all previous settings after reboot? It seems to mostly do so (i.e. most settings and most of the time), but randomly some settings are "randomized". So far I have noticed occasional randomizations on at least trigger type and various trigger parameters (like levels), and wavegen's waveform. Wavegen's freq has twice now been 750Hz after reboot (when I left it at 1kHz). These happen seemingly on almost every reboot, not every parameter, but at least one on each reboot. It might depend on how much of things I changed during the operation, and uncertainty on if I can remember what the setting was before reboot (e.g. did I really leave the trigger level at some value that makes no sense with what I was measuring). One thing happens I guess always: if I have overridden channel probe factor(s) (i.e. not using auto-detect), after a reboot those settings seem to always reset to auto-detect. Bugs? Undocumented features? On wavegen, when selecting an arbitrary waveform that has not been loaded (e.g. accidentally turning the knob the wrong way), the wavegen gets otherwise disabled, but the waveform selection stays active. The latter is good, the former is not. Once the selection is adjusted back to something that works (say, sine wave), the wavegen is still kept disabled, and it has to be manually turned back on. IMHO, it should just stay (logically) on (even if not driving anything), so that when a working waveform is selected again, it will automatically start also driving again etc., as if that visit to the "bad" waveform never happened. 10:1 probe, normal modes (default stuff), trigger at normal (and 0V), probe shorted, 10mV/div, showing about 10mV of noise (as expected). Adjusting position of the channel moves the offset pointer/trigger line smoothly (like 1 pixel at a time, 0.20mV per step), but the shown signal does NOT move up/down at all (it is still updating the data otherwise as expected), until about 11/12th step, when it jumps to the new height on the display. However, if trigger is set to single, showing the one span of noise, that signal view does move smoothly with the position adjustment. I would have expected that normal mode view to move smoothly with the position adjustment, too. Sure, it is mostly noise, but e.g. the average level of the "signal" could be looked at, but with that effect it is not always shown correctly. Explanations? Bug? The behavior ("acceleration") has indeed improved a lot. It still has some minor issues left, e.g. adjusting to lower value seems to happen (in certain value ranges) faster than to higher value. But when it still makes an unexpected fast/large change, the change isn't that drastic, and it is a matter of a second or two to get back on track, instead of the old version's exercise in frustration. At least I didn't bump into old style of behavior during the short testing I made, which included some cases I had specifically made notes of for repeating/testing. My other earlier comment about some minor trigger problems.. I could not find my notes about those (perhaps I wrote them to the paper related to the project at hand, instead of the notes about the scope), so, will have to return to this triggering topic when/if I either find the notes or bump to the issues again.